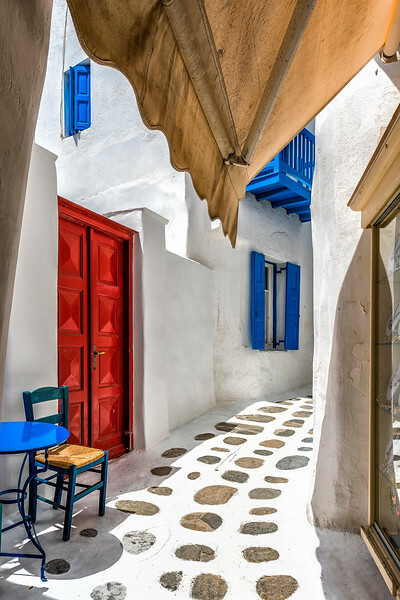 Heading over to Greece, I had great plans on photographing both Mykonos and Santorini. Unfortunately, I wasn't the only one with such plans and while the number of tourists carrying cameras could easily fill a very massively sized camera shop .. like maybe B&H, it didn't diminish my plans on catching some wonderful images. But the thing is, thousands of tourists hanging out isn't generally conducive to catching the true essence of Mykonos. So, with gear in hand, off I went, down side streets and some of the paths less traveled. Finally, I came upon a quiet alley to sit for a moment, have some tea in peace before I rejoined the throngs of tourists having their way with selfies and windmills.